Drainage pipe services are essential in keeping your residential or commercial property running smoothly. 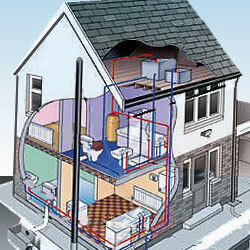 At Cole Plumbing Inc., we specialize in repiping services that are affordable and environmentally friendly. The repiping services our team provides involve updating the pipe that is used for plumbing in your residential or commercial property. Trenchless pipe lining allows our technicians to restore sewer lines without traditional dig-and-replace methods that cause unnecessary damage to your property. The process of trenchless pipe lining involves a nozzle with a sleeve attached to it that is covered with epoxy. Once the sleeve is inserted, the sleeve is inflated coating the inside of the existing pipe with the epoxy resin. It is then left to harden sealing all imperfections within the pipe. This process is completed through a single access point which means that minimal diggings need to be done leaving your property and landscaping untouched. Trenchless pipe bursting can also be utilized to repipe your home or business. Pipe bursting is done by inserting a bursting head with the new pipe attached to it through your existing pipes. While the bursting head moves through your existing drain, it breaks it apart effortlessly replacing it with a brand-new pipe. The debris from the old pipe remains in the soil around it. Through conducting the replacement at the same time as the bursting, we save our customers money and time by easily installing new and reliable pipes. Galvanized pipes are the most commonly used pipeline material found in Alabama and are still found in many older homes in the area. This pipeline material has a zinc coating that can wear off over time, causing the water that flows through it to taste metallic. Copper pipes are a new material that is used for repining. The material does not rust and is easy to repair, and the material can withstand a wide range of temperature changes. PEX pipes, also known as cross-linked polyethylene, are made of a flexible plastic material called high-density polyethylene (HDPE). This makes them easy to install in homes and do not need to be connected with a special fitting. The durable material also allows them to withstand erosion and last longer. Our careful attention to time guarantees that our customers will benefit from any type of repiping service we employ based on customers unique situations. We always come prepared to fix your pipes in the most effective way possible. If your home in the Montgomery area is suffering from pipeline problems, call Cole Plumbing Inc. today for assistance! Our team is made up of the most reliable experts in the industry who will fix the problem with speed and professionalism leaving you with long-lasting results. In need of a plumbing repipe in the Montgomery area? Give us a call today for a thorough estimate by dialing (334) 279-8919.